Personally, I think t-shirts with the slogan ‘I got stewed at SKEWED’ would be great little profit centers. But wouldn’t you know it? This mini-ArtCon is about auctioning artworks from 40+ local artists and giving the money to a deserving beneficiary. By now, we all know how ArtCon works, right? 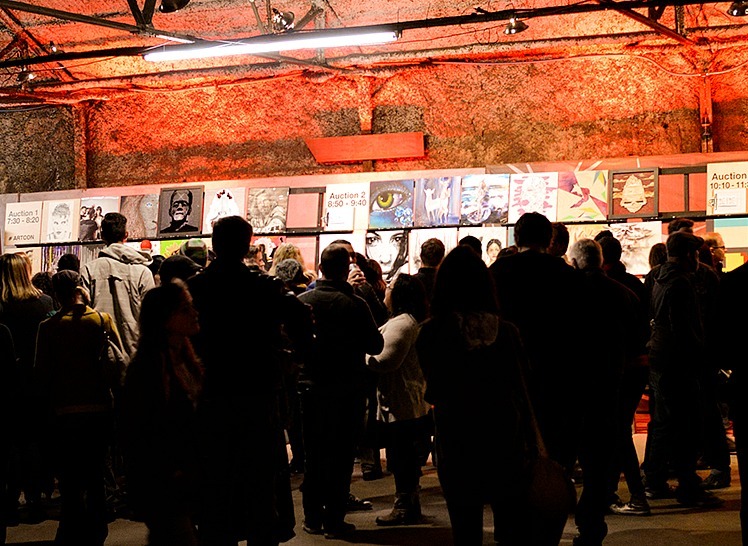 Something like 150 local artists show up at a warehouse, create individual paintings in a single day, the artworks are auctioned off live that night in between music sets by local bands and all the money raised goes to an already selected, deserving, arts-related beneficiary. And let’s not forget: Add beer, crowds, food trucks and auctioneers shouting. Well, SKEWED takes those ingredients and puts a different slant on them (get it?). The more than 40 artists are chosen beforehand, while the beneficiary isn’t announced until after the auction. And then there’s a selected theme for the artworks, which happens to be, well, skewing concepts. In any event, this “mini ArtCon” — taking place June 6th at LIFE in Deep Ellum — also helps seed money for the full-sized ArtCon in November. The bands are going to be Def Rain, Pinkish Black and DJ George Quartz, and some of the artists are Sheryl Anaya, Sergio Garcia, Cathey Miller and Richard Ross. Personally, I think t-shirts with the slogan “I got stewed at SKEWED”(copyright) would be a popular sales item. 40+ Curated Artists Will Auction Work Based on SKEWING Concept and Ideas. Dallas, TX: Art Conspiracy presents SKEWED, a live art auction of work from 40+ curated artists selected to create, and auction, their art based on this year’s inspiration of skewing concepts and ideas. Three local bands will perform throughout the night— Def Rain, Pinkish Black, and DJ George Quartz. The event will be held at Life in Deep Ellum (2803 Taylor St.) on June 6. Tickets are $10 and go on sale Wednesday, May 13 at artconspiracy.org. Aside from being a year round non-profit Art Conspiracy also has a philanthropic side. Each year the organization chooses one charity to designate as beneficiary of proceeds raised through ArtCon signature philanthropy events. The 2015 beneficiary will be announced at SKEWED. Art Conspiracy’s signature events events are designed to be affordable and offer attendees the chance to purchase original artwork with opening bids starting at $50. Featured artists include Sheryl Anaya, Chris Bingham, Sergio Garcia, Leighton Autrey, Cathey Miller and Richard Ross. Please see below for a full list. The bands will perform sandwiched between two live SKEWED auctions. Be sure to catch Def Rain, Pinkish Black, and DJ George Quartz. In addition to the art and music, local food trucks will serve an eclectic mix of cuisines. They will be on site at 6 pm. Art Conspiracy has been organizing artist-led events since 2005 and has given back around $270,000. A part of Art Conspiracy’s mission is to inspire Dallas’ creative community to join forces for the benefit of local non-profit arts organizations. Non-profits with an annual budget of less than $400,000 and that offer creative programming that gives back to youth, families, and citizens within the DFW area are considered to be chosen as Art Conspiracy’s annual beneficiaries.